It’s been a historic week. 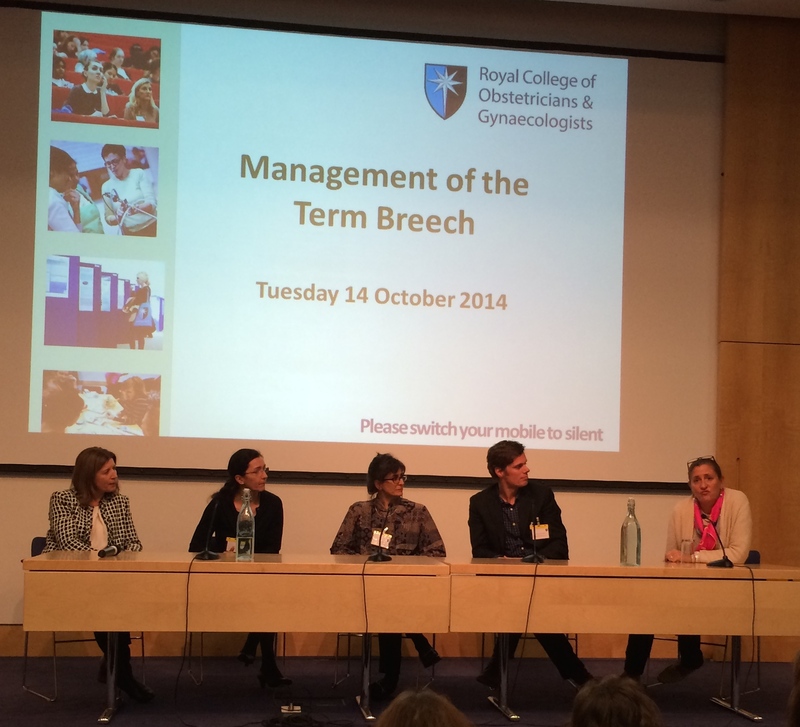 Last Tuesday, 14th October 2014, obstetricians and midwives from around the world converged in the basement of the Royal College of Obstetricians and Midwives (RCOG) in London for a study day on Management of the Term Breech (#RCOGbreech). The day was originally planned to correspond with the publication of the new RCOG guideline, last published in 2006. However, the re-write has been delayed, understandably. Across the country, more and more units are not only raising the level of support for breech, they are supporting women to birth their breech babies in upright positions, something the current guideline recommends women are advised not to do. However, Professor Deirdre Murphy from Dublin created little controversy with her fair and balanced evaluation of the evidence. Although her analysis was much more nuanced, following discussions, the take-home message was: With experienced support, the short-term risks for breech babies (neonatal mortality, serious morbidity) are probably not significantly greater than those for cephalic babies. 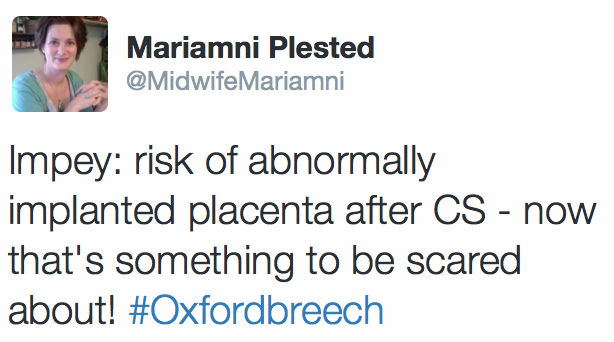 Both breech and cephalic babies have increased short-term risks compared to a planned caesarean section (CS). For breech babies, the available evidence indicates that by two years of age, no significant difference in primary adverse outcomes (death and neuromotor delay) is apparent between babies born after planned CS and babies born after planned vaginal breech delivery (PVD). But babies born following planned CS face some increased risk of other medical problems. 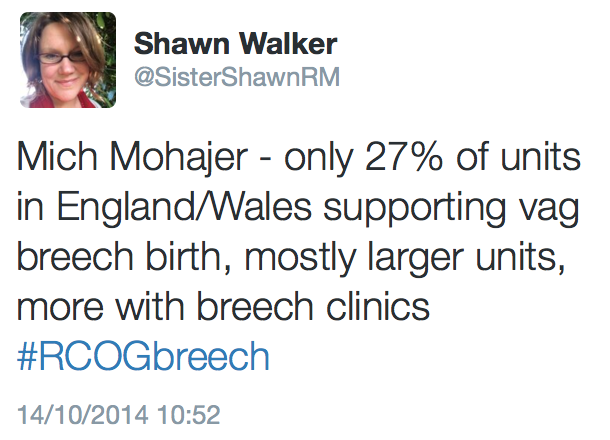 Murphy was followed by Mich Mohajer of the Royal Shrewsbury, who presented evidence from her telephone survey about what exactly is happening around the UK for breech. ECV appears to be almost universally offered throughout England and Wales at the moment, although she found significant variations in models of care, with some units offering dedicated breech clinics and other units offering an ad hoc service on delivery suite. 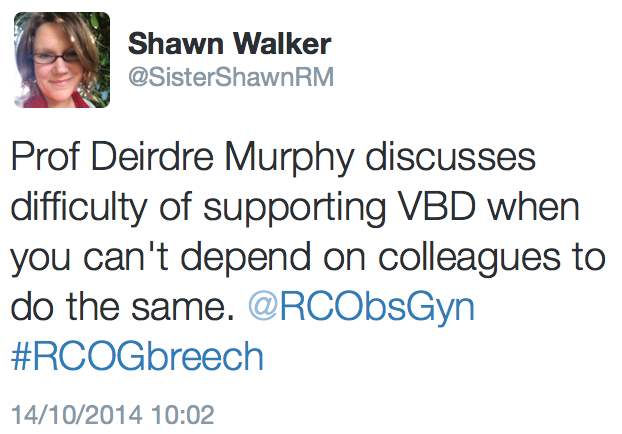 She found even more variations in levels of support for vaginal breech birth, with only 27% of units in England and Wales supporting VBD. 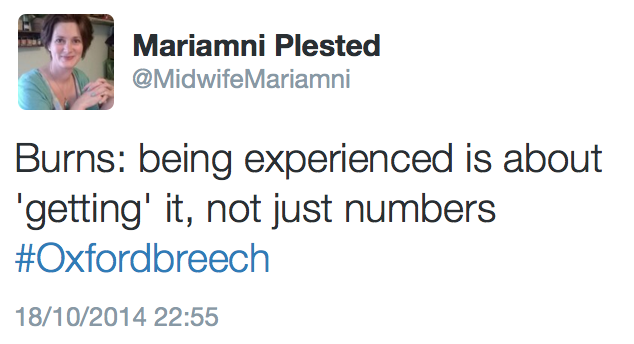 Mohajer also acknowledged the importance of involving midwives with breech skills, as the facilitation of breech births has always been considered part of midwives’ expertise. These two themes: the importance of a specialist approach through dedicated clinics and ‘breech teams,’ and the value of multi-professional collaboration, were echoed frequently throughout the week. After a brief break, Dr Leonie Penna from King’s in London presented on ‘pitfalls and pearls’ in delivering the vaginal breech. She summarised a number of common errors and helpful hints, bringing the focus onto the real gap in clinical skills which will need to be closed or bridged in order to reintroduce systematic support for planned breech births. Penna was also very upfront in discussing the reluctance of the obstetric profession to shift away from women on their backs, even with strong evidence of how helpful it is. She drew parallels with fetal blood sampling, which it is now recommended to perform with women in left lateral. With Penna’s talk, it became clear that the discussion is finally shifting away from an assumption of vaginal breech DELIVERY and towards and understanding of vaginal breech BIRTH. 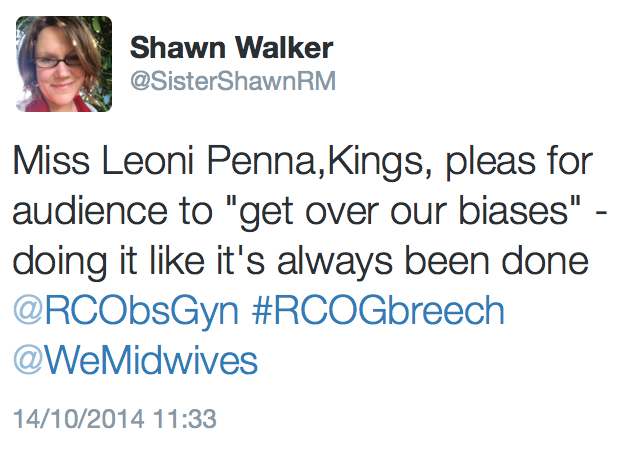 Finally, Penna as well emphasised the important role midwives have always played in supporting breech births at King’s. After this, Dr Anke Reitter presented on her experience of being a part of the now-famous breech clinic in Frankfurt, and her MRI data demonstrating how significantly maternal movement affects the dimensions of the bony pelvis. 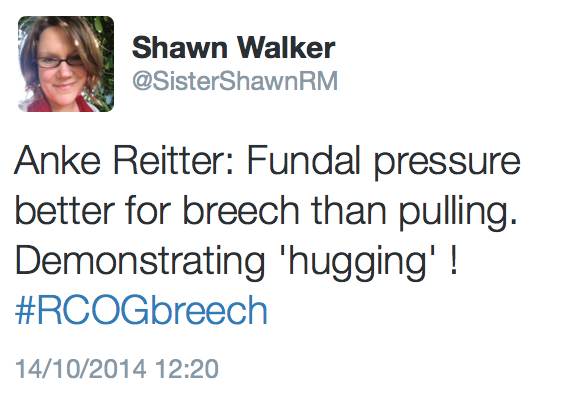 Reitter (@OB_Anke) also discussed how our current understanding of helpful manoeuvres for upright breech birth – especially the first principle of rotation by the shoulder girdle rather than the pelvis – is not new. She showed captivating drawings from historic German and Australian textbooks showing nuchal arms and how to resolve the problem. 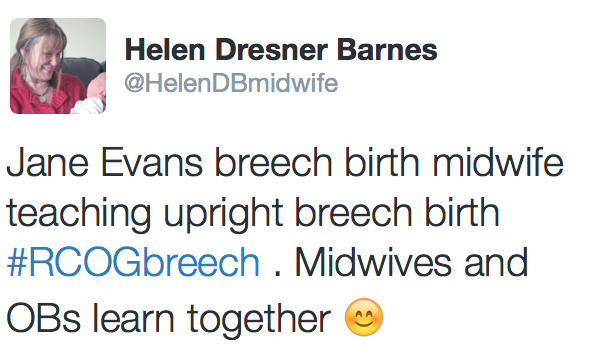 Thankfully, Reitter will be returning to the UK in June to share her hands-on skills at one of our Breech Birth Network Physiological Breech Study Days. Visiting speaker Thomas van den Akker, obstetrician and researcher from the Netherlands, reminded the audience of the RCOG’s responsibility to the developing world. In less resource-rich countries, CS presents a much higher risk to women and their future children than it does in the UK. But the world follows the RCOG’s example and demands the highest standard of care, even when it is inappropriate in that context. Van den Akker also presented data from follow-up studies by the Vlemmix team which demonstrate that per 10,000 babies delivered by CS for breech (compared to planned VBD), there were 26 neonates saved in the first pregnancy (19/7442). However, there were 27 neonates (18/6689) lost in subsequent pregnancies in a policy of trial of labour. Can we continue to recommend that first time mothers avoid a vaginal breech birth, while encouraging them to plan a vaginal breech birth after caesarean section (VBAC) in their next pregnancies? Over lunch, Jane Evans gave a presentation of the mechanisms of breech labour, and strategies to help when help is needed. She brought along her slide show and doll and pelvis, for those who wanted to make the most of every minute available to learn breech skills. After lunch, the morning speakers engaged in a panel discussion about how the term breech should be managed. 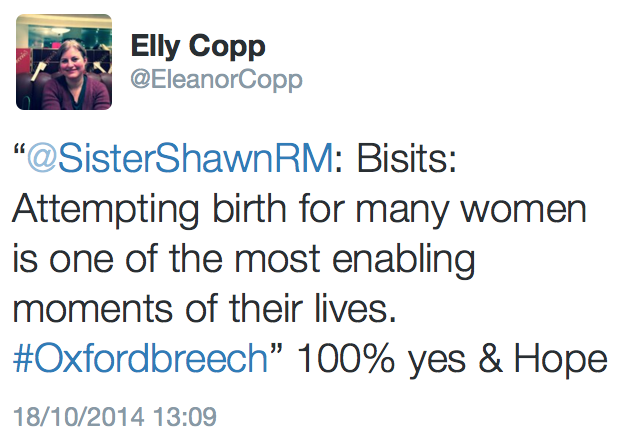 The relaxed mood and support for the option of vaginal breech birth was clearly emotive for some. 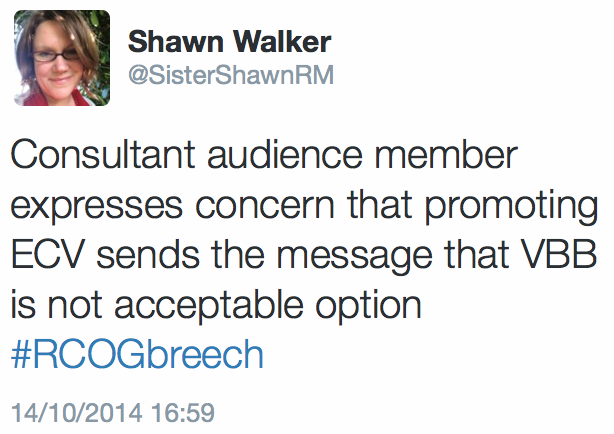 One obstetric delegate stood up and shared how he had become a pariah among his colleagues for continuing to facilitate vaginal breech birth (VBB), and how he hoped the new guideline would be more clear about how important and appropriate it is to support VBB. This was followed by talks by Impey and Hedditch about the evidence base, practice and their clinical experience of external cephalic version (ECV). Like many other professionals, I have made a pilgrimage to Oxford to visit their renowned clinic and learn from them and their community midwife colleague, Pauline Ellaway. They presented their most recent statistics, which like others’ (see Grootscholten et al, 2008) show a higher rate of interventions and adverse outcomes for post-ECV babies than babies who spontaneously assumed a head-first position (neonatal mortality = 0.9/1000; not significantly different from 1.3/1000, the neonatal mortality for planned VBD in the Netherlands reported in Vlemmix et al). This is a video from a Dutch team which also use a two-person approach. This then opened up the discussion in the final afternoon panel to a point I had not previously hoped was possible: The genuine suggestion that perhaps dedicated ECV services should become dedicated Breech services, where women’s individual clinical situations are evaluated and those felt to be good candidates are offered a VBB, while those who are not felt to be good candidates are encouraged to consider ECV. (Selection criteria remain controversial, but this openness is a very good start.) The strong message was that women should have access to a high-quality, experienced ECV service, but this should not be the only alternative to CS. Dr Joris Hemelaar also presented about rates of undiagnosed breech in Oxford, which are over 20% like most places in the UK which do not do routine third trimester scans (which are not recommended by Cochrane. 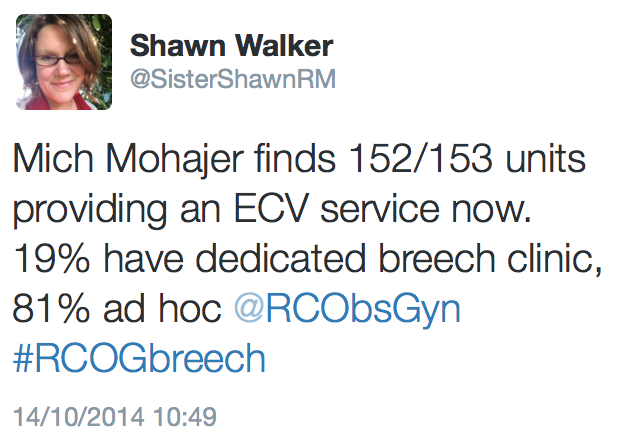 Hemelaar’s point in presenting this information alongside reports on breech/ECV clinics is that we cannot offer women an ECV or detailed counselling about VBB if we do not detect the breech antenatally. However, and my view differs somewhat, as we do not yet have any evidence that the undiagnosed breech is at greater risk in the UK. Most of the available evidence indicates that the undiagnosed breech is far more likely to be born vaginally, at no increased risk. The situation is unlikely to change until more than 27% of UK units support a planned VBB, and until that time, obstetric and midwifery-led units would be wise to put a proactive plan in place so that these births can be managed with a calm, team approach. 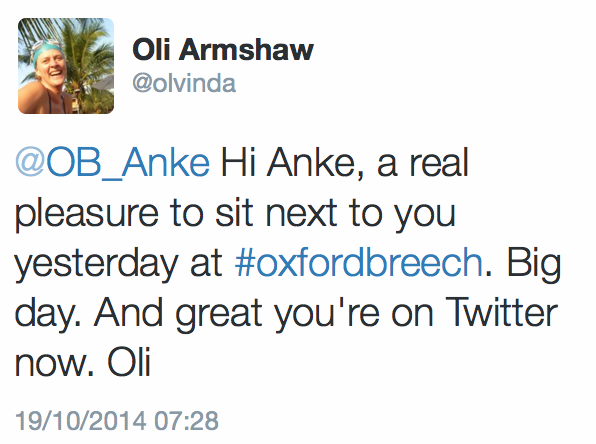 As if the RCOG conference was not exciting enough, Senior Midwifery Lecturer Ethel Burns of Oxford Brookes University made the most of international visitors to host a conference on “Breech Birth: Sharing what we know and do, and exploring best practice for the future,” on Saturday, 18th October 2014 (#Oxfordbreech). The day included repeat presentations (for a new audience) from Anke Reitter and Anita Hedditch, and Jane Evans again presented her slides, mechanisms and manoeuvres over lunch; but there were some additions. Maternal mortality and morbidity is dependent on emergency CS rate but unless this is >50% is likely to be increased with a polity of elective CS. This is particularly important in the developing world. In the long term, there is a small increase in risk of mortality and morbidity to future babies through unexplained stillbirth and uterine scars. 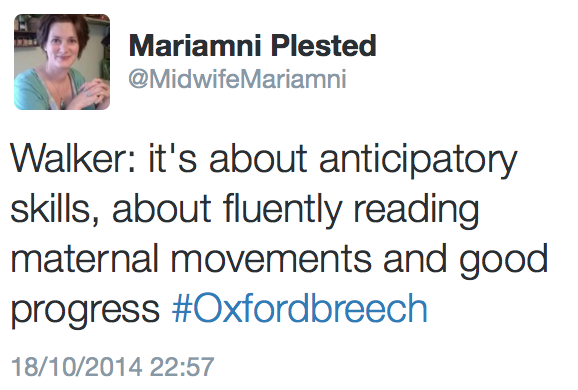 Impey was followed by Ruth Sloman, who has recently completed her Masters in Midwifery at Oxford Brookes. 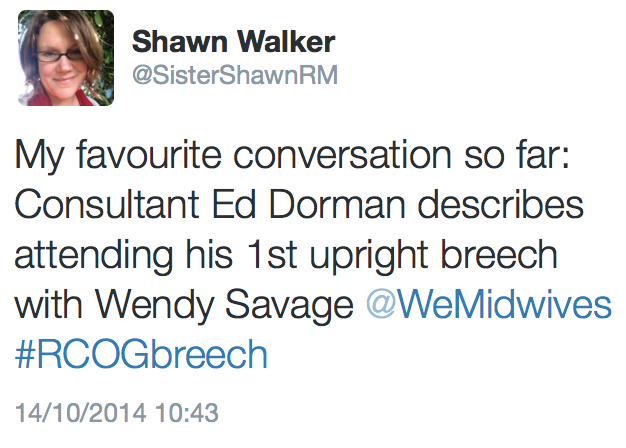 Sloman used focus groups to look at midwives’ knowledge and experience of breech births. I really enjoyed this presentation, and some of Ruth’s themes resonated with my own research, especially the value of video footage in helping professionals to learn when hands-on experience is difficult to come by, and midwives frustration at witnessing vaginal breech deliveries poorly managed and the lack of choice available to many women. After the break, the conference continued with Dr Andrew Bisits, FRANZCOG of Sydney, Australia. Bisits’ sensitivity to women’s experiences has made him beloved of women and midwives across the globe, and his long-term commitment to supporting vaginal breech births has gained him knowledge and experience exceeding most obstetricians working in 2014. Crucial to Bisits’ talk was a recognition of how important the experience of attempting a vaginal breech birth is to some women. He also encouraged us to recognise that moderate risk-taking confers psychological benefits. Although Bisits’ talk included much more than I can summarise here, a final important point concerned the ‘atomic reaction’ which usually follows adverse outcomes in breech births, and knee-jerk responses usually preclude any genuine learning from these events. 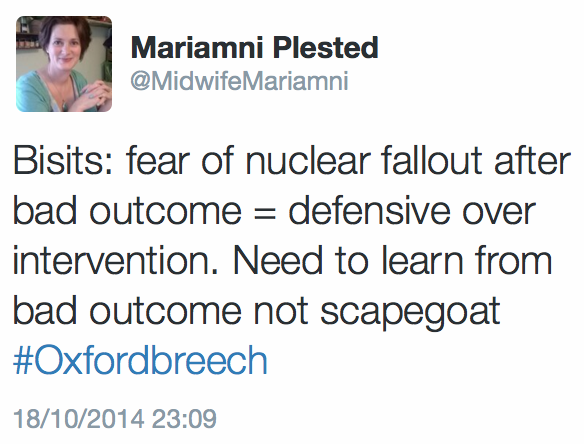 If we are to improve the safety of breech birth, it is vitally important that we learn from adverse outcomes by reflecting on them in an open and enquiring, rather than punitive way. Reitter and Bisits are of course not only two of the most highly experienced breech practitioners in the world, they are passionate advocates for the use of upright positioning. Reitter’s clients birth mostly in all fours/kneeling positions, and Bisits’ clients commonly use a birthing stool. Their view is that it is not so much the position, as the ability of women to move spontaneously and assume the position of her choice, which matters most. The mood of both days indicated that this point has been well and truly made and heard by those writing the new guideline. The question became not so much whether upright positioning would be acknowledged as a legitimate approach, but whether or not it will continue to be considered in any way ‘alternative’ in the new guideline. Betty-Anne Daviss visited from Ontario, presenting an encapsulated history of the women’s movement in Canada, and how this has influenced the progress they have made with breech birth. She explained the way in which the Canadian-born Coalition for Breech Birth worked with sympathetic doctors and midwives to reintroduce the choice of VBB. Remarkably, Daviss has succeeded in gaining privileges to attend VBBs in her local hospitals, and currently supports approximately 1-3 women per month to achieve their goal. If policy-makers are now acknowledging that VBB carries a similar risk to cephalic birth in experienced hands, then those who continue to advocate a maternal birth position (lithotomy) which deviates from the current standard of care should present evidence as to why they are doing this, rather than the other way around. Experience alone may be enough to explain it for those who have continued to safely facilitate VBDs, but the next generation and those who have taken a 14-year hiatus would do well to learn the new upright techniques as part of their standard training. If the authors of the new RCOG guideline walk the walk as well as they have talked the talk in the past week, some major changes are a-foot. But policy changes are only a small part of what happens on the ground, evidenced by the fact that the RCOG has recommended the choice of VBD be offered to women since 2006, something that is clearly not happening universally in the UK. A major cultural shift is required, but these two events suggest that the shifting has indeed begun. 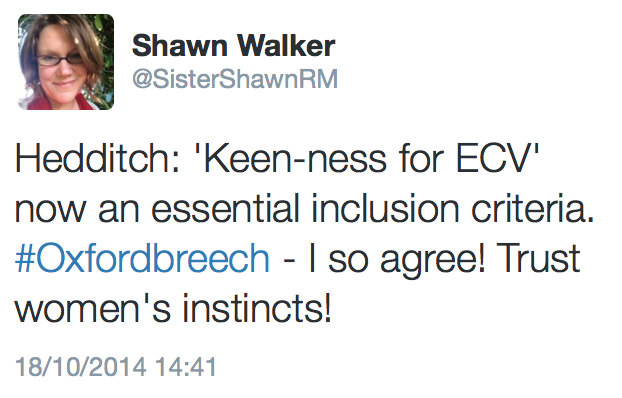 Well done you if you’ve read all the way to end of this post, and join the breech activist club! If you found other aspects of the day important and informative, please do highlight them in the comments below. 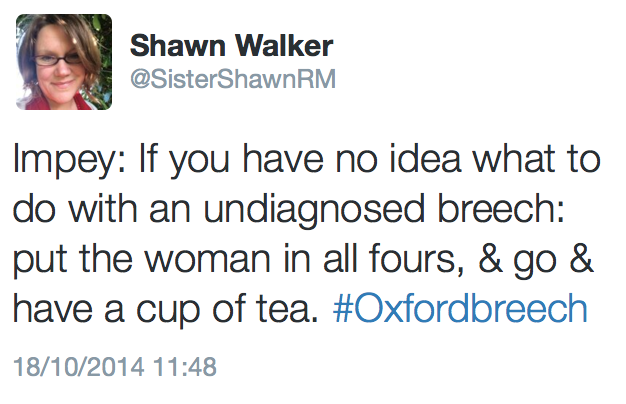 This entry was posted in Conferences, Research, Study Days and tagged breech, ECV, guideline, maternal morbidity, neonatal mortality, obstetric heroes, RCOG, research on October 19, 2014 by midwifeshawn.